Kataclysm's X-Men Pages Forum • View topic - fun x-men evolution mistakes WARNING: loads of pictures! fun x-men evolution mistakes WARNING: loads of pictures! Talk about episodes and characters from X-Men: Evolution. Last edited by Rogue Recruit on Tue Jul 08, 2008 2:16 pm, edited 1 time in total. Rogue Recruit wrote: wanna put that to a test? relax, no one wants you gay, you're better off straight anyway, lol! actually, it was a positive for everyone else. pls dont be gay. 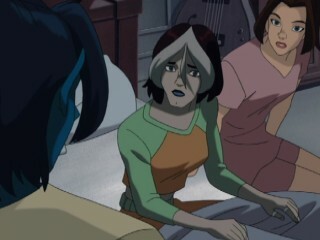 Re: fun x-men evolution mistakes WARNING: loads of pictures! What's wrong with being gay? ya! its actually kinda fun! Location: swimming somewhere with the mermaids, or running through the forest with indians. u don't mind if they're gay, straight, trans, cross-dresser, or anything. I always go for personality, not looks. beastchicky wrote: u don't mind if they're gay, straight, trans, cross-dresser, or anything. so, i guess that makes you bi too:P i guess i dont mind all that, like i have nothing against it, but i dont wanna go out with a transgendered guy or girl. its a long story but, ya. i have nothing against it, but...ya. (im guessing ur a girl)...so u wouldnt mind dating a guy who is actually a girl, or vice versa? if they didnt tell me, i would freak out. i wouldnt date them cuz i think it would be to weird. Not really a mistake, but am I the only who's noticed how Rogue is never seen without her makeup? Seriously, her makeup is never seen running, even after she gets thrown into the pool in "Joyride,"
and right after she gets out of the shower, she's wearing makeup. There are three types of people in the world: those who see, those who see what is shown to them, and those who do not see. ^ What can I say, the girl loves her make-up. Good eye, by the way. WandaMaximoff wrote: ^ What can I say, the girl loves her make-up. I guess she does! Although I'm curious about how her makeup doesn't even run when she takes a shower, or why she puts on her makeup first thing when she gets out of the shower, but your answer makes the most sense. I've read from other people that Rogue's face is so pale because she wears white face powder and stuff, and I never get that. 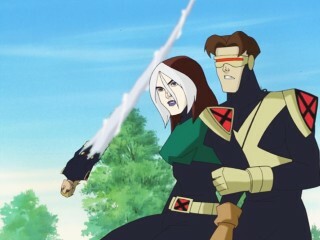 Rogue's pale; her hands and neck are obviously the same tone as her face. She doesn't wear face powder. I don't get why people don't get that. 1)Rogue's gloves often switch on and off between shots (In the series as a whole, that is). For example, when Rogue exits the bathroom with Risty, her gloves are gone, but then the gloves reappear. 2) When Storm hits Rogue with lightning, Rogue's leggings are gone and her legs are bare, but when Rogue returns the lightning, the leggings are back. 3) Rogue, Kitty and Jean are in Jean's SUV, and Kitty asks Jean if she and Scott had begun dating. Kurt 'ports in asks "Who's dating?" He wasn't in the car when Kitty said it, so how did he hear? 4) When Scott and Logan go into the warehouse to go after Rogue, Scott tells Roberto, Ray, Amara and Kurt to stay behind. But in a back view shot, you see that Roberto has very light skin and light brown hair. He's Hispanic for the entire series, for those of you who don't remember. When Rogue attacks Gambit at Magneto's base, his eyes are the characteristic red pupils with black sclera. But at the airport with Logan and Sabretooth, there is a scene where he looks at the radar and his eyes shift back and forth, and his eyes are obviously black irises with a normal white sclera. All of the newer ones you posted, while truly goofs, are most likely just continuity problems that all cartoons have...except for that thing with Kurt 'porting and knowing exactly what was being said, I have no idea about that one. Also, the thing with Roberto - they most likely put Bobby in the background instead of Roberto, yet another continuity thing. *shrugs* I never noticed that, though. I don't know why people insist Rogue wears powder to make herself pale, I find it ignorant as well, though. Rogue must be wearing water proof type of make ups. You know those that wouldn't run even if you go swimming. I'm also guessing she's too lazy to remove them when she sleeps. Or it could be part of her mutation. Also, about the kurt thing, maybe he was just a short distance away not seen in the camera and he could hear them talk vaguely and then he 'ported in to get on the juicy details. OR, maybe he could hear thinly from the destination he is going to what they are talking about a few secs ago. Rogue Recruit wrote: Also, about the kurt thing, maybe he was just a short distance away not seen in the camera and he could hear them talk vaguely and then he 'ported in to get on the juicy details. OR, maybe he could hear thinly from the destination he is going to what they are talking about a few secs ago. I don't know if the former would work, because Kitty and Jean began talking in the car while driving away from the Institute, so it's not like he heard them talking while at the Mansion. 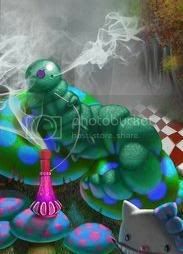 But the sun roof of the car was open, so maybe he was in a tree or something, heard the conversation and teleported in.